And this is true, even though voodoo, in contemporary American culture, is more linked to cinematic camp like Angela Bassett’s fiery rendition of voodoo icon Marie Laveau in American Horror Story: Coven than a real source of belief and power that can create connections between disparate parts of the Caribbean diaspora. As artist Christopher Udemezue (Neon Christina) writes, “To this day, queer and POC history is often relegated to the back of the history books, if it’s included at all. Vodou, for example–a religion with roots in non-gender-binary practices, which liberated Haiti from French control–is demonized in contemporary media and pop culture” (3). Beyond just a visual artist, Udemezue is the founder of RAGGA NYC, a community of queer Caribbean multidisciplinary creatives and their allies whose work is currently on view in the exhibition All the threatened and delicious things joining one another at the New Museum. Started in 2015, based on queer dance hall parties that Udemezue organized in New York, RAGGA NYC is, as Udemezue describes, a “hybrid of ideas that began as late-night conversations over familial island roots, current social politics, empanadas vs. beef patties, pump pum shorts, scamming and a longing for an authentic dancehall party that would also provide a safe space for queer Caribbeans and their kin” (3). Curated by Sara O’Keeffe, as a part of the New Museum’s Department of Education and Public Engagement’s R&D Season: BODY, RAGGA NYC harnesses their Caribbean roots, history and spirituality as potentials for collectivity, creativity and resistance. Udemezue observes in the mission that mining his identity as a queer Caribbean was invaluable. “For me,” he explains, “my road to self-love and pride has been rooted in knowing where I come from. Looking into Caribbean history, spirituality, and my people as a whole has fast-tracked a sense of self-worth and strength–especially given the current state of the country and the world” (3). Titled after a quote by Martinican writer Edouard Glissant, the exhibition fills the Museum’s fifth floor with a range of artists, writers and oral history. 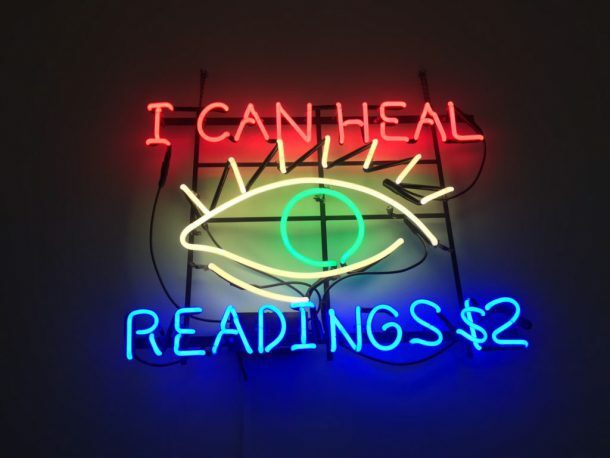 It’s no mistake that this space also showcased last year’s The Waiting Room by Simone Leigh–an exhibition, which drew on the place of herbalists and alternative forms of healing in the Black community to make up for the oversight by dominant institutions like the healthcare industry. 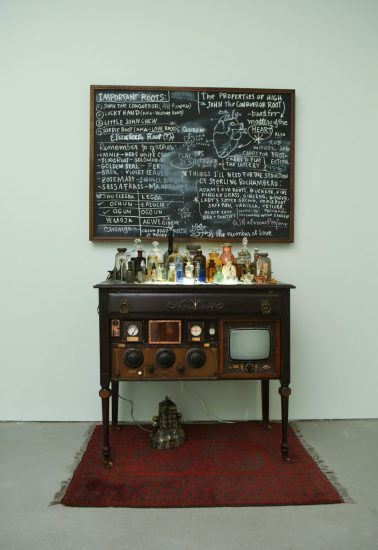 RAGGA NYC’s exhibition seems to expand on Leigh’s show and it’s not just the similar aesthetic of a root medicine shop found in Renée Stout’s installation The Rootworker’s Table. The strength of Leigh’s exhibition and, in particular, her public programming was its potential for community building and RAGGA NYC is a prime example of how these communities of queer people of color can organize, celebrate and support themselves and their unique diasporic experiences. The exhibition itself spans mediums and disciplines, but many of the included works engage with history. Take, for example, Tau Lewis’s sculptures like Georgia Marble Marks Slave Burial Sites Across America, which features a bust with chain-linked hair set on cinderblocks. The serene-looking sculpture mimics a type of marble that was once described in terms of “light, medium and dark creole.” More than merely referencing the commodification and consumption of the skin color of the Other, the sculpture takes on additional meaning once viewers learn that this type of Georgia marble is typically used in government buildings. This stands as a potent metaphor for the traumatic legacy of slavery and subjugation that pervades America’s architectural prowess and political history. Other works investigate fraught personal connections to the Caribbean, particularly for individuals who no longer live in the region. 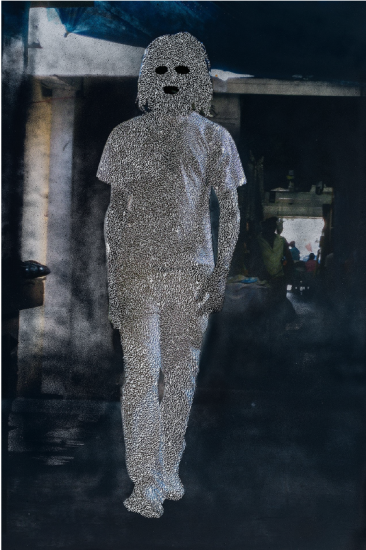 Paul Anthony Smith’s ghostly masculine figures in Port Antonio Market #3 and #4, as well as his haunting series Grey Area, document his complicated interaction with home and displacement. 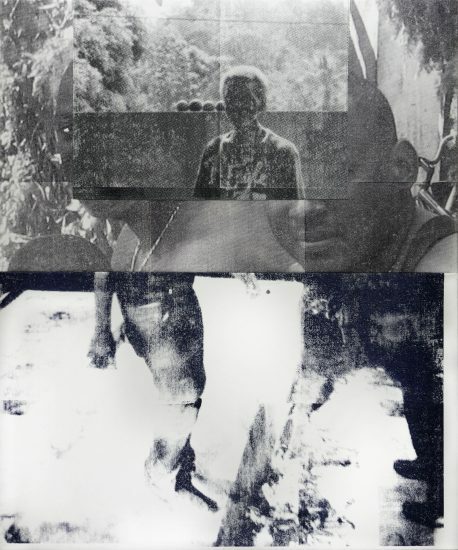 Grey Area fractures and superimposes ethereal black-and-white images taken of his male friends and acquaintances in his hometown in Jamaica while he was visiting for his uncle’s funeral. There’s a underlying sense of memory and nostalgia, as well as a palpable loss, familiar for those who have migrated and can never fully return home. In Eduoard Glissant’s Poetics of Relation, he emphasizes the significance of poetry even in a world filled with violence. “This is why we stay with poetry,” he notes, “And despite our consenting to all the indisputable technologies; despite seeing the political leap that must be managed, the horror of hunger and ignorance, torture and massacre to be conquered, the full load of knowledge to be tamed, the weight of every piece of machinery that we shall finally control, and the exhausting flashes as we pass from one era to another–from forest to city, from story to computer–at the bow there is still something we now share: this murmur, cloud or rain or peaceful smoke. We know ourselves as part and as crowd, in an unknown that does not terrify. We cry our cry of poetry. Our boats are open and we sail them for everyone” (9). However, one of the most arresting works in the show is barely visible. Carolyn Lazard and Bleue Liverpool created an installation, Chaos-monde, of five totems below the floor of the New Museum. The totems depict an astrological map of two major dates in Caribbean history: January 1, 1804, which is the date of Haiti’s independence and October 27, 1978, which is the independence of Saint Vincent. Chaos-monde stands as a spiritual honoring of these anti-colonial benchmarks, rendering the floor of the New Museum as a site of cosmological remembrance. In combination with the dates themselves, the refusal of visibility of this work is a direct rebuke of the colonizing gaze of the typical (white) New Museum viewer. “We demand the right to opacity, ” writes Glissant in Poetics of Relation(189). By embracing opacity themselves, Lazard and Liverpool maintain the power in their ritualistic act. Glissant later describes, “Opacities can coexist and converge, weaving fabrics. To understand these truly one must focus on the texture of the weave and not on the nature of its components. For the time being, perhaps, give up this old obsession with discovering what lies at the bottom of natures.” (190). Lazard and Liverpool block the viewer’s gaze and in doing so, ask for viewers to release themselves from the drive to “figure out” work by the Other. Anti-colonialism and its intersection with spiritual traditions appear again in photographs by Chrisopher Udemezue. 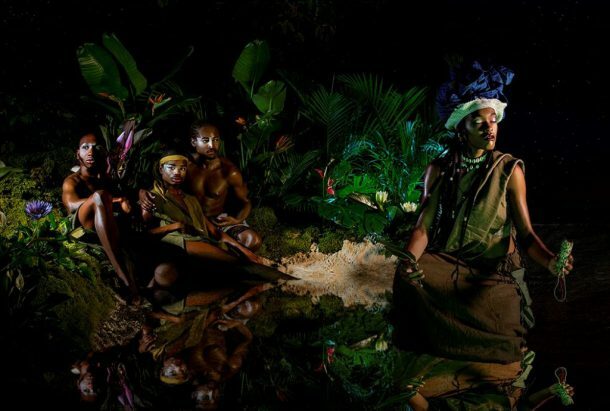 One photograph portrays Queen Nanny, a woman as she sits the forest with her brothers, escaping slavery. Queen Nanny would later become a leader of the Jamaican Maroons. 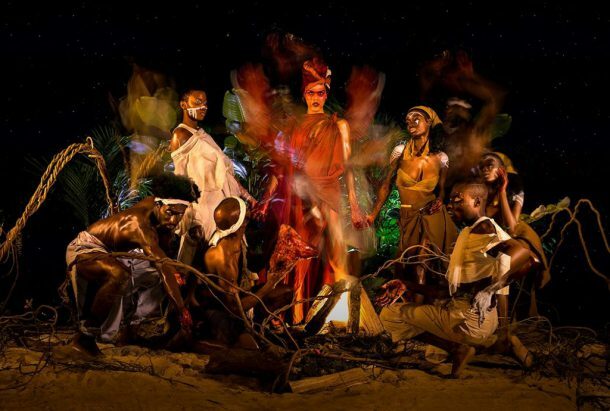 Another photograph depicts Cécile Fatiman and her fated Vodou ceremony held at Bois Caiman. This ecstatic ceremony, rendered in vibrant tones in Udemezue’s photograph, is responsible for sparking the Haitian Revolution in 1791. A week after the Vodou ceremony, 1000 slave-owners were killed. Udemezue imbues Fatiman with an otherworldly power as she stands in blood red in the middle of the crowd. Tags: All The Threatened and Delicious things joining one another, Bleue Liverpool, Caribbean, Carolyn Lazard, Christopher Udemezue, diaspora, Edouard Glissant, Haitian Revolution, Jahmal B. Golden, Maya Mones, New Museum, opacity, Paul Anthony Smith, queer Caribbean, RAGGA NYC, Renée Stout, Sara O’Keeffe, Shanekia McIntosh, Simone Leigh, spirituality, Tau Lewis, The Waiting Room, Vodou, witchcraft, Zora Neale Hurston. Bookmark the permalink.